JYSK Flyer March 3/15/18 - 3/21/18 ~ The new flyer by this JYSK Store contains Big savings deals. Lea Collection Hand Towel, Kronborg Jersey Fitted Sheet-Twin, Lennon Shelving, Dyvig 4 Piece Conversation Set. 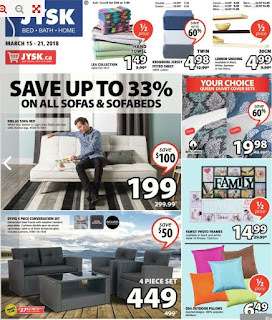 Save with digital shoping at JYSK Canada store. An interesting range of JYSK Bed Bath Home products is the list on this week. Vaasa Bed Frame-Twin $159.99 Regular Price $129.00 Sale Price Up to $30.00 Savings Black powder coated steel frame with laminated flex slats. Double sale price $159.00. Regular price $179.99. Queen sale price $169.00. Regular price $199.99. 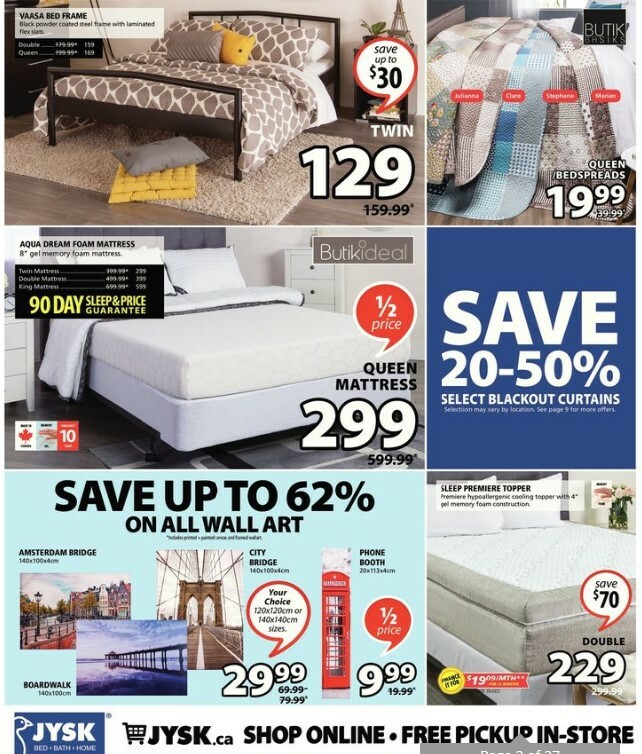 Butik Basiks Queen/Bedspreads $39.99 Regular Price $19.99 Sale Price Julianna, clare, stephane, marian. Butikideal Aqua Dream Foam Queen Mattress $599.99 Regular Price $299.00 Sale Price 50% Savings 8" gel memory foam mattress. Twin mattress sale price $299.00. Regular price $399.99. Double mattress $399.00. Regular price $499.99. 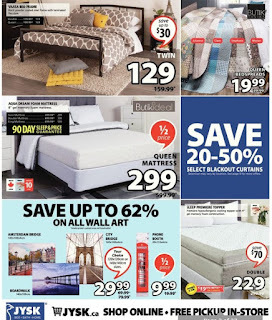 King mattress $599.00. Regular price $699.99. Made in Canada. Memory gel. Warranty 10 years. City Bridge Wall Art $69.99-$79.99 Regular Price $29.99 Sale Price 140 X 100 X 4 cm. 120 X 120 cm or 140 X 140 cm sizes. Sleep Premiere Topper $299.99 Regular Price $229.00 Sale Price $70.00 Savings Premiere hypoallergenic cooling topper with 4" gel memory foam construction. $19.09/mth for 12 months. Before taxes.